Mason Mount's hat-trick helped Derby keep their play-off hopes alive and edge troubled Bolton closer to relegation. Only 2 got this spot-on, with a further 25 having the outcome. Barnsley moved back into the automatic promotion places in League One with victory over 10-man Fleetwood. Nobody had this spot-on, but 24 did get the outcome with a massive 16 going for a 2-0 in what was the weeks most predicted score. Portsmouth make it five straight wins in the League after this comfortable victory. Everybody predicted a win for Portsmouth, but it is well done to the TheHappyGooner for being the only one to get it spot-on. Sunderland's first home league defeat of the season saw their 19-match unbeaten run in League One come to an end in this remarkable game. No points for anybody from this game, with 25 predicting a win for Sunderland, and the other 3 going for a draw. Exeter got their play-off bid back on track with a comfortable win against a poor Port Vale. A big 10 got this spot-on, and another 11 had the outcome. League Two leaders Lincoln became the first club to win promotion in the English Football League this season after this draw. Well done to ghughes11 for being the only one to have this spot-on, with everybody else predicting a Lincoln victory. This was the second time this season we have had a week where the six home teams looked good things, and we ended with a very similar outcome. On the other occasion in Week 24 four home teams did manage to win, with the other games producing a draw and an away win. That sequence of results was repeated this week, and just like in Week 24 only one of the home wins achieved a decent number of 3 pointers. Finally the top score in Week 24 was 8 points, and that was the top score this week as well. There were three members who achieved that mark, they were TheHappyGooner who had the Exeter 2-0 spot-on to go with their good Portsmouth 4-1 pick, also mfb_cufc and Sector4 who both had the wins for Derby and Exeter spot-on. All three had two outcomes as well to give them that decent 8 points. Picking six good looking home wins is something I will do again next season, and it will be interesting to see if it produces similar results. Just 20 games in two 10 game weeks left to the season now, and DON'T FORGET THE FIXTURES ON THE FIRST OF THOSE TWO WEEKS IS GOOD FRIDAY. In the Premier With the top three all predicting Exeter to win 2-1, in what turned out to be the only obvious 3 pointer this week, they had to all settle for having four outcomes. That leaves noah4x4 with a slender one point lead from sevebalo, that is worth two with his superior 3 pointer total. Even though he has more 3 pointers than anybody in both divisions, RSCOSWORTH will require a few more if he is to win a first title. In fact he could still come under pressure to hold onto the final Charity Shield spot, as TheHappyGooner moved 4 points nearer to him with their top scoring effort. The only change in this division saw one of the weeks other top scorers mfb_cufc move up a couple of places. A Charity Shield spot looks out of reach for him, but I am sure he is just pleased he has secured his Premier place for next season now. It is now looking inevitable gsy163 will be relegated, but who joins him is still unclear with burnsieespana closing the gap on eagledares to 3 points. It looks like one of those two will be occupying that final spot unless they can get big points from the final 20 games. If they do gerry_us could be under threat, but having that Exeter 2-0 spot-on did him a big favour this week. In Division One That top scoring performance has just about secured automatic promotion for Sector4. After going 2-0 all games Colukev remains favourite to join him. Another to benefit from having that Exeter 2-0 spot-on was unitedwhites, and he remains in contention for that other auto place, but is now almost guaranteed a play-off spot in an excellent first season. Another rookie having an excellent season is blueeagle, and going 2-0 all games has enhanced his play-off ambitions. After being there or thereabouts all season basher2010 looks to have secured a deserved play-off spot. The final play-off spot is very much up for grabs. The storming run of form that took wessex_exile up to third place after Week 27 has leveled out since then, and he is now clinging onto that final play-off spot. Going 2-0 all games proved to be the right prescription for medicine_man, and moved him to within 2 points of the top six. He joins Daniel and Blue4U2 on that same total. 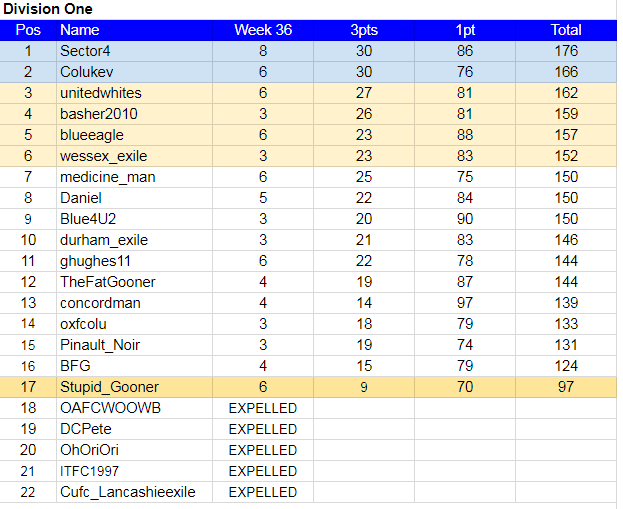 Two big weeks from durham_exile, ghughes11 or TheFatGooner could still see them extend their seasons with play-off games. Despite having more outcomes than anybody in both leagues concordman has less 3 pointers than anybody except Stupid_Gooner, who has missed many weeks, and that looks to have left him short of a play-off chance. Week 37 Fixtures Picked by this weeks guest Daniel, with a region/rivals theme. With virtually no games on Saturday THE DEADLINE THIS WEEK IS GOOD FRIDAY 15.00. WE ARE THE HAPPY GOONERS ! LONDONS FINEST ! Poll: Brexit time to exit ! But where to go ! ! If you could ! I fear I might be doing a "Col U" at the moment - fingers-crossed these get me back on track for the play-offs. unitedwhites, no score has been predicted for Macclesfield in the Northampton v Macclesfield game. PM has been sent. Tropical_Us, no prediction for the Port Vale v Stevenage game. PM has been sent. FOR THOSE WHO HAVE YET TO POST THEIR PREDICTIONS, DON'T FORGET THE DEADLINE THIS WEEK IS GOOD FRIDAY 15.00.